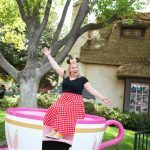 Whenever I plan a trip to Walt Disney World or Disneyland, my first thought is to figure out a rough itinerary; next, my mind goes straight to what outfits I want to pack. I look for inspiration through Instagram, Pinterest, and also knowledge of what I’ve liked on past trips. I have a few requirements when it comes to outfits for Disney. First of all, they must be comfortable. I’m a Rope Drop to Wishes (well, now Happily Ever After) type of girl. In our most recent trip, we got to the park even before the park even opened with Early Morning Magic! I highly recommend spending your birthday at Walt Disney World (and getting a button, everybody wishes you a happy birthday AS THEY SHOULD). While my actual birthday day was spent swimming with sea cows (aka Manatees), I’ve considered all week my birthday, including our day at Magic Kingdom. I found the #purplewall and made sure to get a photo. This week has been an absolute blast, and Brad has become a rather good #instagramhusband 😂. My shirt says it all, best birthday ever. Second, I want the outfits to be cute. I always plan on lots of photos during our vacation so I want to make sure that I like how the outfits look in photos as well. No matter how many different shorts I buy, I almost always end up wearing the same pair at Disney (good thing I have a couple pairs). These Hudson Shorts are seriously the best shorts ever. They have a nice bit of stretch (for when you enjoy a selection of Mickey shaped treats), and are nice and cool for the warm Disney days. While sneakers might not be the most fashionable choice, your feet will definitely thank you after 30k+ steps (plus hours of standing). I was always surprised to see how many people walk around the parks in really uncomfortable looking footwear. I like to bring a couple different pairs to alternate throughout the week to make sure that I’m not rubbing the same locations every day. I HIGHLY recommend to pack some blister guard band-aids. Do you have a Star Wars and Disney fan in your house? This tee is one that I made for my trip to Disneyland back in March. I knew that they now had Star Wars characters that you could meet so it was perfect for my interaction with Darth Vader. A couple weeks ago I decided that the tee needed a matching tumbler for the summer so now I can completely geek out in my outfit. As for tees, I always have a fun time making my own. I try to make each outfit themed towards the park I’m visiting that day. 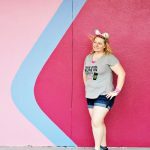 I wore my Darth Vader with Mickey balloon to meet Star Wars characters at Disneyland, and my “Best Birthday Ever” tee for the day I visited Magic Kingdom to celebrate my birthday. A great Disney outfit wouldn’t be perfect without some great Ears and a cute manicure. I LOVED the ears that I got from Oh Toodles Ears off Etsy. Not only were they adorable, they were super comfortable. Normally I can’t wear headbands because they give me headaches, but I had absolutely no problem with these (plus, they stayed on my head too). The owner was also AMAZING to work with. She made sure to make sure that the ears arrived in time for my vacation and I got TONS of compliments on them throughout the parks. But first, coffee. When we got to Disney Springs on Sunday, my first stop was @starbucks because it was needed. 😂 My coffee went perfect with my Starbucks cold cup ears from @ohtoodlesears too! We are having such a great time so far in Orlando, I can’t wait to share more details once I take a break from having fun. Also, I’m loving how great my subtle Mickey head nails turned out 😍😍. 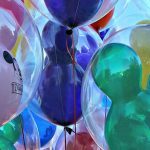 I always have a great time at Disney, and hope that this has given you some great ideas on what to wear for your next Disney vacation. These are cute and look so comfy! I love each of em. Your shirts were so cute! 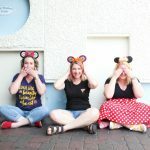 Loved doing WDW with you two. I love that shirt! So true, gotta be comfy for Disney! When we went last it was early Spring and I wore t-shirts and capri leggings so I could easily chase kids and still have fun lmao also the material dries really quickly. Ugh I miss Disney. I LOVE all of your shirts! So cute and creative. Not to mention comfy. You definitely have stay comfortable, yet cute when trekking around those Disney parks all day! :) Loving the t-shirts. 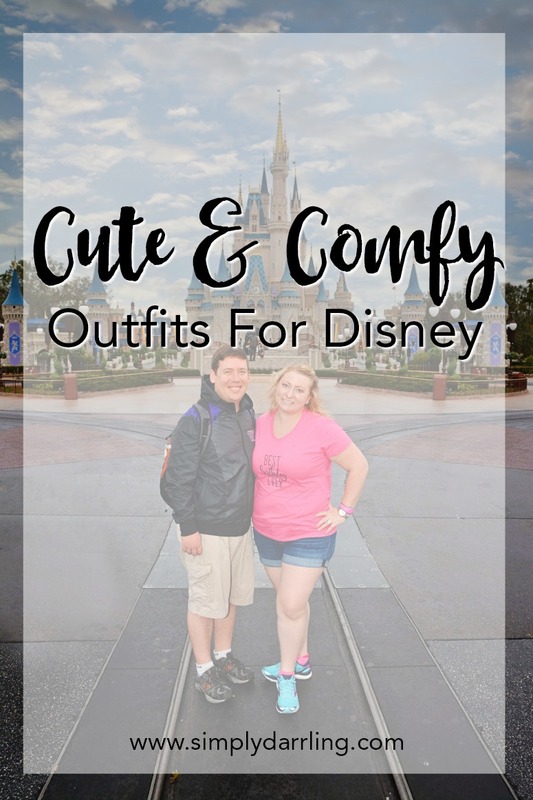 Comfy outfits are a must for Disney!